The planned trip to Granada was a bit slow off the mark, what with first breakfast, followed by a shower and second breakfast. It was 10:30 before Ian programmed the GPS in the iPhone for Alhambra Granada and we were away. We thought it was a bit strange that HereMaps sent us off via Antiquera and indeed it was. Cath couldn’t understand why we were being directed through the middle of Antiquera, until she rechecked the program and found that we were being directed to a street in Antiquera of the same name. Oops! After a bit of bad language, road rage and deep breathing, we reprogrammed and once again headed for our target. 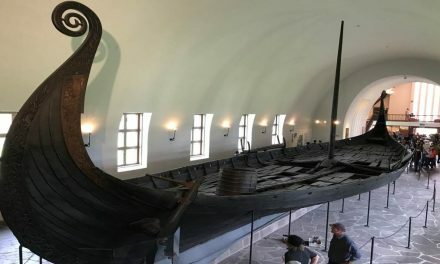 This time we got it right and were soon on the A-92, barreling along at 120km/hr. As we’ve mentioned before, the freeways are pretty good in Andalucia and the A-92 was no exception. Like the highways, it has a lovely median strip filled with cream oleanders and yellow broom. The road climbed steadily and in less than two hours we could see the snow topped Sierra Nevada. 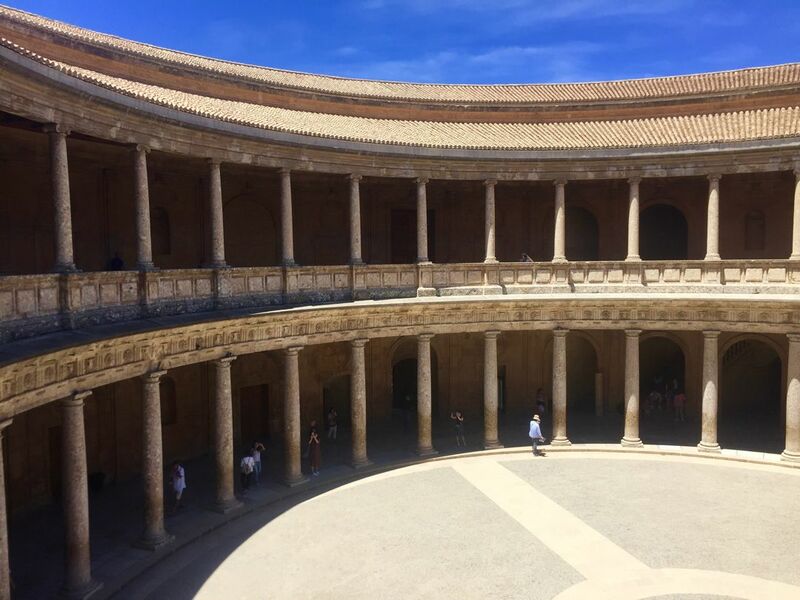 Assuming you have a GPS programmed correctly, it is a simple matter to follow the ring road from the freeway to get to the Alhambra, which sits high above the city. However we again managed to confuse the issue by going through the city. Nevertheless, a couple of tweaks to the GPS were required before we climbed up the hills and finally arrived, cruising down into Car Park 1. From there it was a short walk down to the ticket office. There was quite a crowd gathered near the office, milling about, as crowds are want to do and we took the opportunity to step into the ticket queue. Sadly we soon noticed a sign informing one and all that tickets for the palace were sold out, a common issue for us in Spain. Perhaps our planning has been a bit, relaxed. We felt somewhat frustrated as we had been unable to buy tickets on the web, however Cath overheard a staff member informing some other tourists that the rest of the castle and grounds were free to visit simply by walking down the hill a little further, to the second street on the right. Off we went. The gardens within the walls of the Alhambra are filled with large trees, mainly elms, roses and lavender and at this time of the year the sweet smell of honeysuckle fills the air. As we wandered further down into the grounds past the castle, we found a delightful rose garden and you wouldn’t believe it, a Cerveceria. Bless the Spaniards, they love a beer, which is always welcome in the heat. Forgoing that particular pleasure was a test we only just managed, as we bypassed the enormous line of people waiting to enter the Patio de Machuca and found our way into the Palacio de Carlos V, a beautiful circular two storey concert arena, where the art gallery and museum are located. 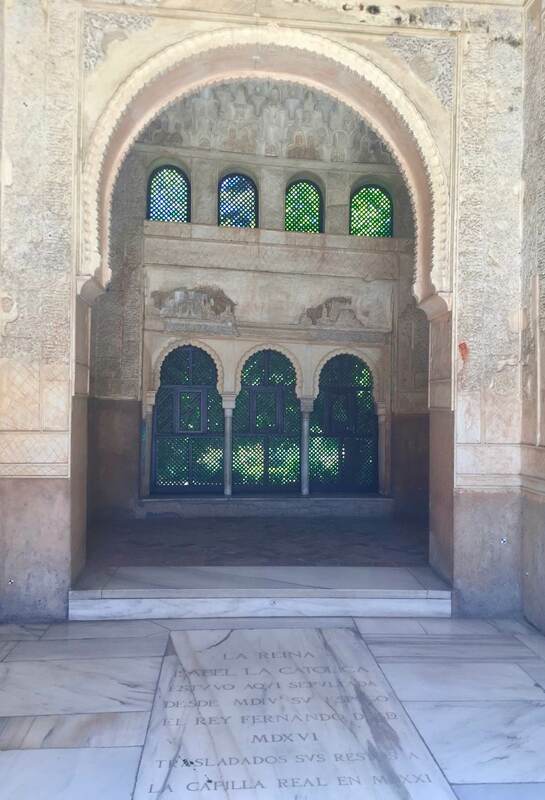 Unfortunately they are closed on Mondays and so we continued to amble through the gardens before checking out the Hamman, a steam bath from the Moorish era, which is free to enter and has beautiful star shaped skylights casting pretty patterns on the floor. Walking back up toward the gardens, we found a charming courtyard at the front of the the Parador de Granada hotel. Entering through the doorway which leads to the hotel lobby, we noticed a small courtyard, with an alcove that apparently contained Queen Isabella’s original grave. Beside this, we observed through a trellised divider, an Arabic style tea room which was only open to the guests of the hotel. Naturally, we stole a couple of quick pics. The many copies of the site map which are located throughout the grounds and buildings gave us clear directions on where to go, however they didn’t make it clear that one cannot get to the Generalife Gardens by following the steep path which runs between them and the main complex. Ian took full advantage of this option, which saw us descending down and down between ever towering cliffs on either side, until we finally emerged at the bottom and found ourselves in the old part of the city. It was a shame to have missed the gardens, however it was a complete bonus to be in the old city and we wandered along, enjoying the sights. 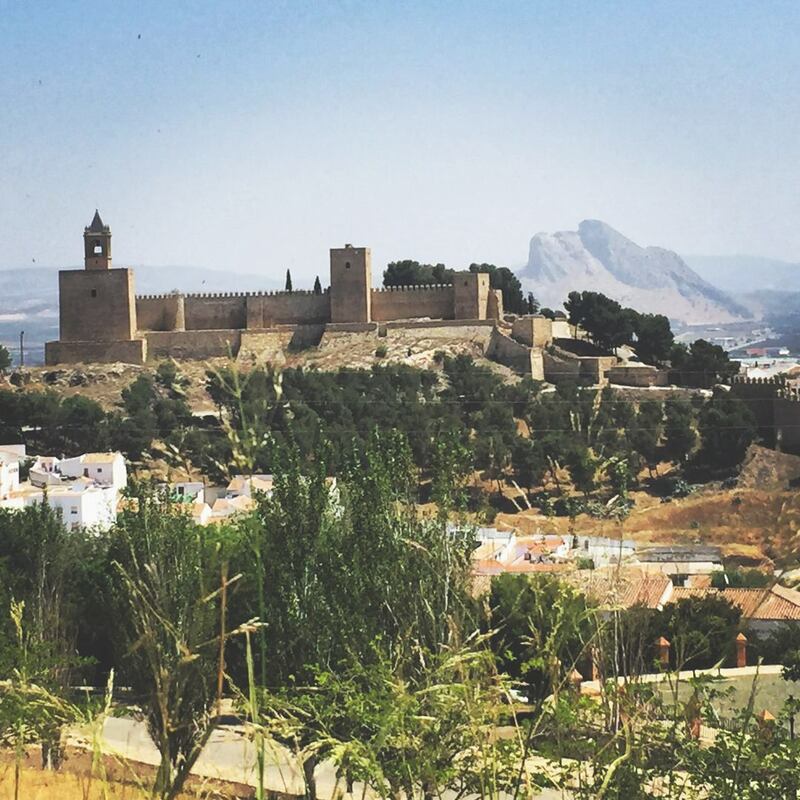 The old city surrounds the bottom of the hill that the Alhambra sits upon and much like the medinas of Morocco and the old towns in England, is a mass of winding streets and alley ways. We ambled along, admiring the many steep side streets, tapas bars and restaurants, eventually arriving in the Plaza Nueva, where we came across the imposing Tribunal Superior de Justice Andalucia, four storeys, typically embellished and no doubt very scary for those who have to present themselves there for judgement. Gradually the street resolved itself into the Calle Reyes Catolicós, a major thoroughfare and we soon arrived at the Plaza Isabel La Catolicó, which has a marvellous statue of Christopher Columbus seeking approval from Queen Isabella for his trip in search of the Indies. It is strange, but as you walk along a little further, the street has shade cloth strung high along the roadway, presumably for the benefit of traffic as well as pedestrians. As the city became more and more grandiose we glimpsed the Catedral de Granada down a side street and headed straight for it. 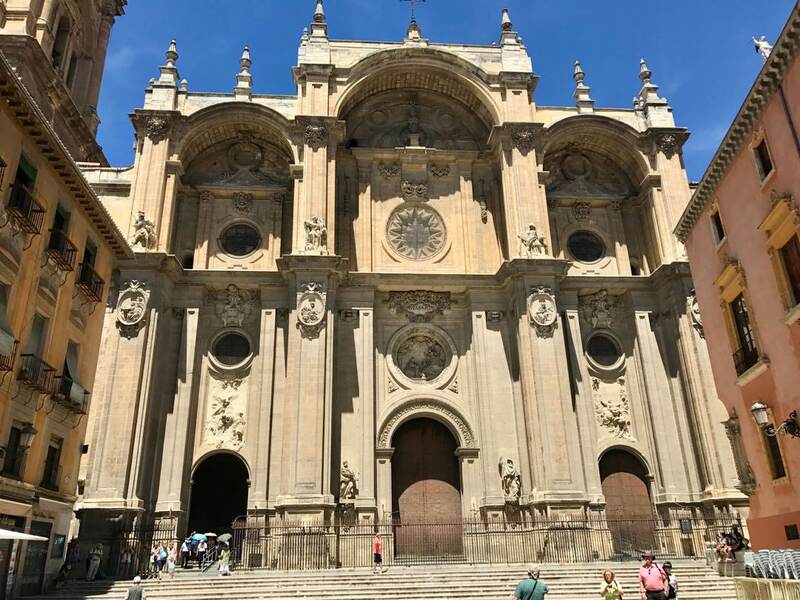 The cathedral is, as expected an amazing building, with intricate carvings, a massive belltower and, as a few found after circumnavigating it, a medium sized square in front of a very imposing edifice. As ever, we stuck to our rule of not paying to enter churches, took a couple of pics and found our way to a pretty little square, the Plaza de la Romanilla, for a much needed beer at La Tortuga Boba, where they provided us with an accompanying paella. €7 all up. Granada is a city filled with orange trees and the scent of oranges, mixed with the scent from the many spice shops, was a heady mix. Not too sure why the spice stalls were concentrated in that area, but what the hey, we sniffed it all in, although we had to admit it didn’t really compete with the stalls we had seen in Marrakech. Before long the lengthening shadows reminded us that the afternoon was getting late and so we began the stroll back up the hill, to the Alhambra and our car. 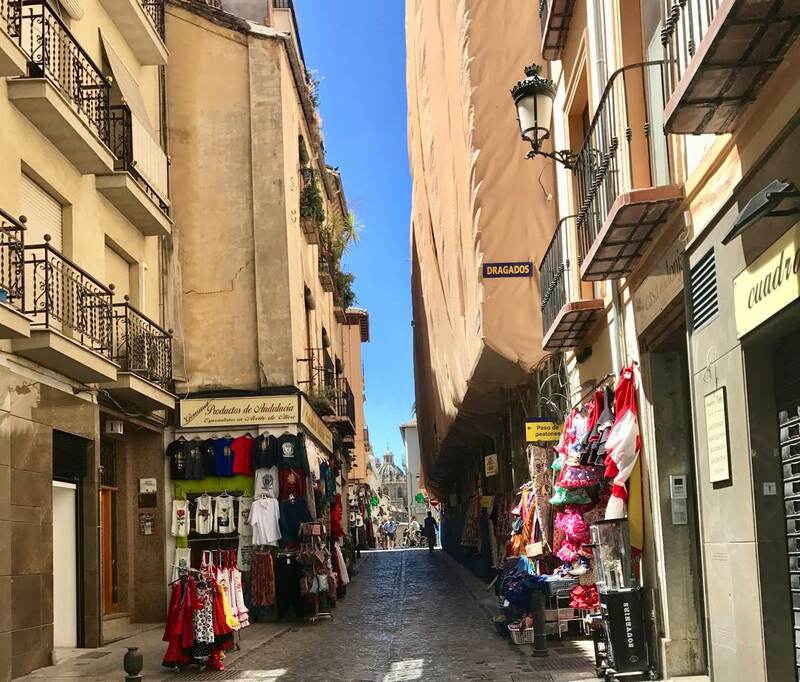 The stroll through the lanes and alleyways was delightful, past numerous restaurants and bars, gift and souvenir shops, until after checking HereMaps we realised it was time to tackle the slope and began the climb up narrow cobbled streets. As we neared the gates back into the palace grounds, we were delighted to note a couple of guitar shops, where the luthiers still plied their trade, making beautiful classical guitars. Although the incline had been a little challenging, once into the palace grounds, where the road bifurcated, we had to make a choice and unfortunately it appears we picked the steepest path. It was a long way back up, however thanks to the numerous trees, a forest really, we were kept in shade the whole way. Thankfully we are hill walking fit, unlike some of the much younger brigade, who were struggling up the hill ahead of us. 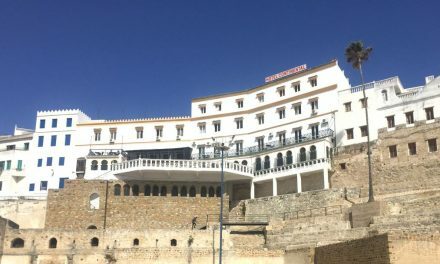 Finally we had powered up the hill, grabbed a few more snaps of the gorgeous Moorish gates and walls and located the top and the car park, where we found the price for a 5 hour stay was €7.50. 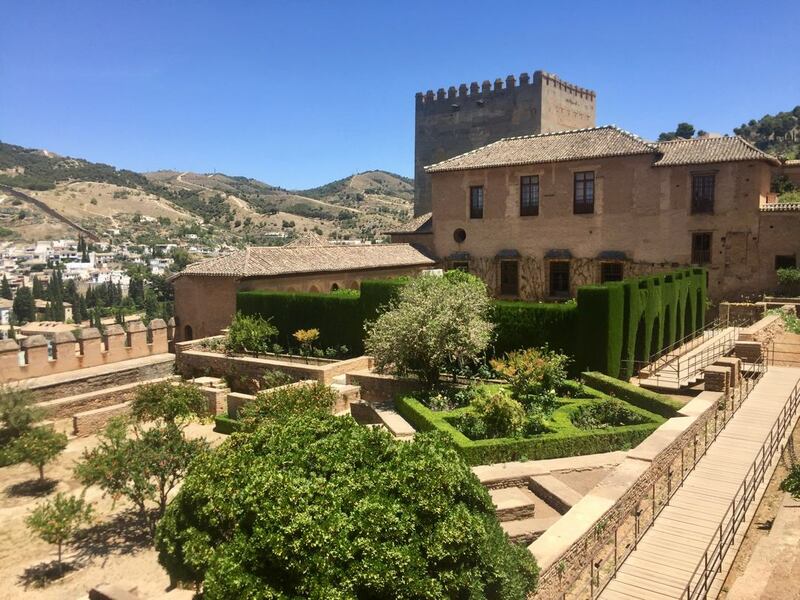 We loved our day trip to Granada but wish we had done a little more research before we went, Seeking the Spanish Sun has some great tips in her travel blog. If you enjoyed this Travel Tale please share it on your social media channel of choice. We would love to hear about your Travel Tales too, leave us a message below. 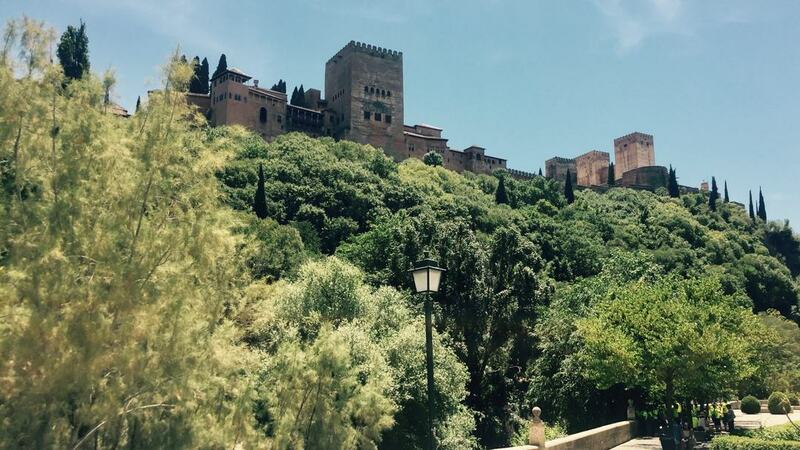 Beautiful pictures and beautiful Granada. 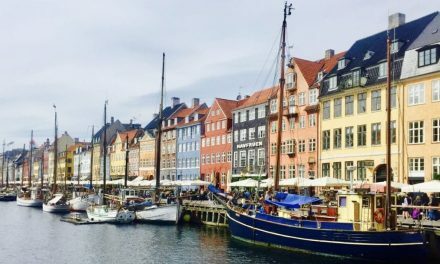 I loved to read your travel experiences. Your articles are very well narrated..
Hi Amisha, thank you for your comments, we are glad you enjoy the narrative style of our posts. Sounds like you had a good time! It’s always nice to hear about other people’s travelling adventures. 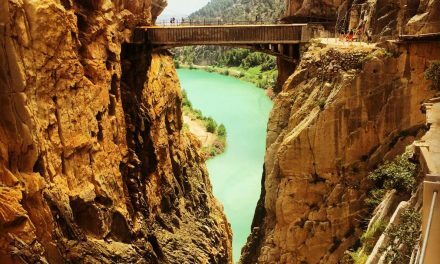 Spain is a beautiful country and I’m sure visiting Granada in Spain will be even fun. Great tips.